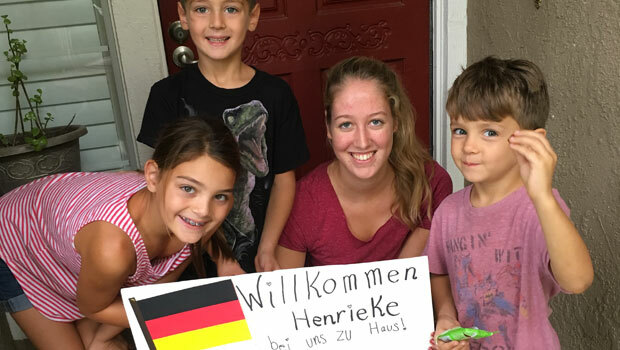 Henrieke is welcomed by her host family. Photo courtesy of Henrieke M.
You will be experiencing a brand new culture and way of life and may not be familiar with things that are common knowledge or habitual to your host family. Don’t be afraid to ask about the simple things; in a new country, even the ordinary can be new and different. Do any family members have food or environmental allergies? What is your family’s emergency and fire evacuation plan? Is there a meeting point? What are your family’s rules on opening the door to strangers? Alarm systems: How do you turn it on and off? When do you turn it on? Door locks: Practice locking and unlocking. When should doors be locked? Smoke detectors: Where are they located? What should you do if there is a fire during the day? At night? Is there a fire extinguisher? Where is it located? Circuit breaker box: How and when do you operate it? Where is it located? Medicine: Where is medicine kept safely in the house? Cleaning supplies: The brand names and types of supplies might be unfamiliar to you. What are they each specifically used for? Where should they be kept when not in use? Are there any other hazardous materials in or around the house? Sharp objects: Where are certain items, such as steak knives and scissors, kept out of reach? Windows/screens: Are they allowed to be kept open? Childproofing: Are there childproofing systems used in the house? Security gates? How do these work? Emergency contact numbers: Where are they kept? Home address: Are you allowed to give out the home address? To whom are you allowed to give the address? Important documents: Is there a safe place for you to store your passport, insurance information, and other important paperwork? What are other safety concerns for the home? Washer and dryer: How much detergent goes in the washer? What water temperatures should be used? What can and cannot go in the dryer? Is there a preferred time to do laundry? Toilet: Where do the toilet paper and feminine hygiene products go? Does the lid stay down or up when not in use in your house? What do you do if the water keeps running? Dishwasher: What can and cannot go in it? Should dishes be rinsed first? What items go where in the dishwasher? Heating and air conditioning: How do you adjust the thermostat? What are the standard, minimum, and maximum settings? Garbage disposal: What can and cannot go down the disposal? Shower: How does it work? Is there a family shower schedule in the morning? TV/DVD player: How does the remote work? Is there any chance you could accidentally order a movie? Any specific hours the TV is not allowed on in your house? What are the limitations on the time spent watching TV? Entertainment systems: What remotes do you use? How do you turn everything on or off? What are the settings? Stove and oven: Gas or electric? How do you turn it on and off? Microwave: How does it work? What can/cannot go into the microwave? Coffee or tea maker: Where are the supplies? How are they used? How are they cleaned? Is there an automatic shut-off? Vacuum cleaner and floor mops: How do they work? How often do you use them? Where are they kept? Ask if there are additional household appliances in the home and how they work. 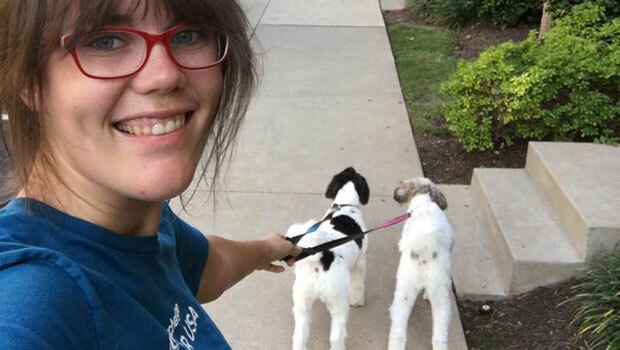 Kelly takes the family's dogs for a walk. Photo courtesy of Kelly M.
Where are the sheets, towels, and blankets kept? Where can you hang up your towel? Where should coats be hanged? Where do boots, shoes, umbrellas and other items go? What is your family’s policy on turning off and keeping lights on in the house? Ask your host family to point out all of the light switches. Family pets: Who feeds and walks them and how often? Are they allowed outside? How should pets be disciplined? Ask about any other dos and don’ts with pets.